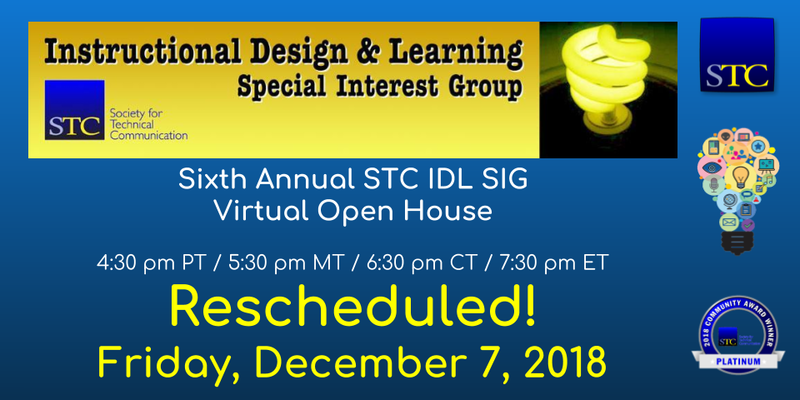 Announcement: Your IDL Leadership Team needs to reschedule this meeting for December 7. We’d like to combine our VOH with a virtual party (VP), where we would encourage all attendees to turn on their web cameras, share a photo or story. The VP (not be confused with Vice President!) we hope will add a very human, personal side to our VOH. Hey, it is all about making real, enduring connections! See the 2017 VOH recording on YouTube. The 2018-2019 season of webinars is up and running. As you know, our IDL SIG produces educational webinars that are free to members as a benefit of membership. Students and academics also attend for free. Check out the lineup we have in store. Watching Li-At Rathbun work a room is a joy. 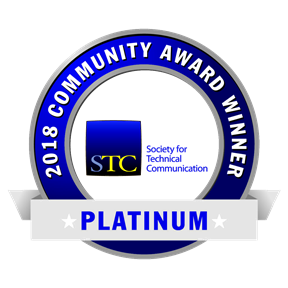 That’s why I knew that her presentation, “We Stoop to Conqquer: Adjusting to Mediocrity,” would be a must-see for me at the 2018 STC Summit. Once again, she did not disappoint. Li-At Rathbun puts her own spin on the project constraints triangle: fast, accurate, accessible. 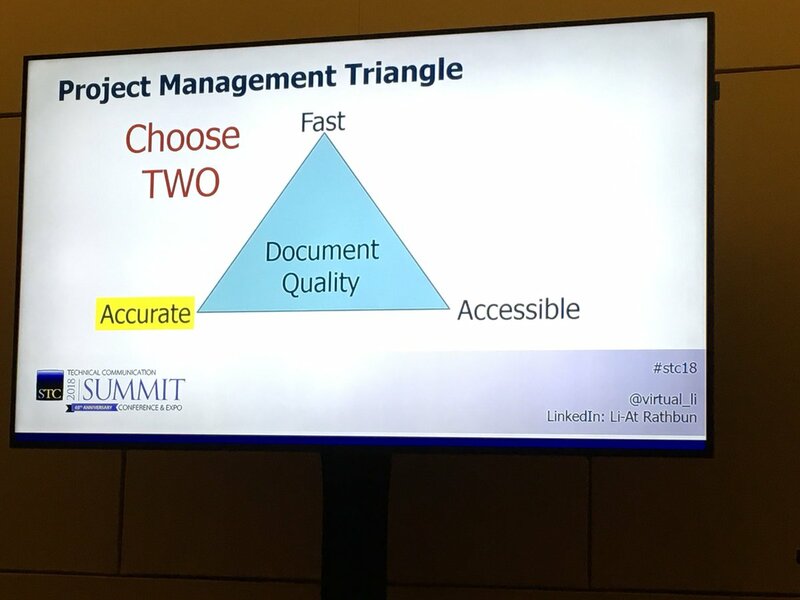 Rathbun reinforced the project constraints triangle that managers often use to make choices between the competing demands for quality, scope, and cost. 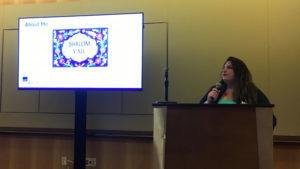 Creating a safe space for open discussion, Rathbun devised a “cone of silence” and even gave us our choice of male, female, or gender-nonspecific anonymous names. Let the healing begin. Attendees began sharing their painful stories about projects for which they had to let go of quality for the sake of a deadline. We heard real stories from frustrated editors, writers, and managers. I can’t disclose specifics, of course, but I can reassure you that if you’ve ever been asked to hurry up and not be so picky, you’re not alone. Also, lots of SMEs think that good writing is easy. Hilarious. Rathbun has the gift of engaging an audience and drawing them out. When writers or editors asked a difficult question, she turned to the managers in the crowd for an answer. She kept the conversation going and reassured attendees that the struggle is real. She also encouraged us to share our coping strategies, keeping the discussion upbeat. I left the presentation feeling energized and affirmed. I am not alone in having to balance and let go. The room was full of fellow travelers who have to make hard choices. We accept mediocrity for the sake of cost and schedule. We live to write again on the next project. My favorite take-away came from attendee Kathy Johnstone who advised that we keep three priorities in this order: get it done, get along, and get it right. Relationships and team morale are more important than perfectionism and will ensure that the next project goes smoothly. Sometimes we just have to let it go. Rescheduled due to Hurricane Michael! Join us for the Can You Hear Me Now? 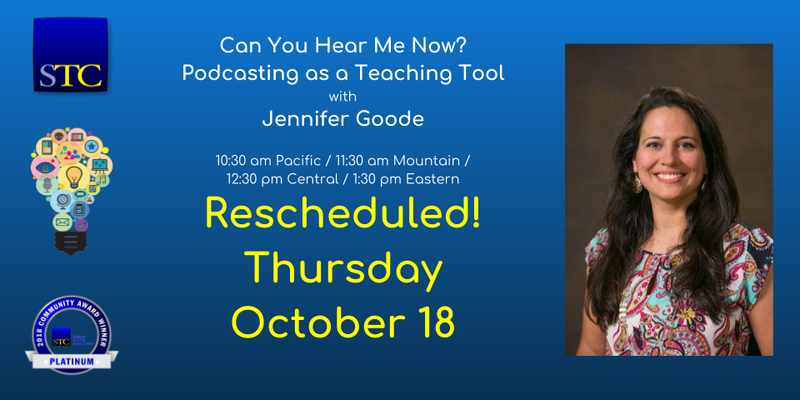 Podcasting as a Teaching Tool webinar with Jennifer Goode. Podcasting is one of the fastest growing areas of content production today. 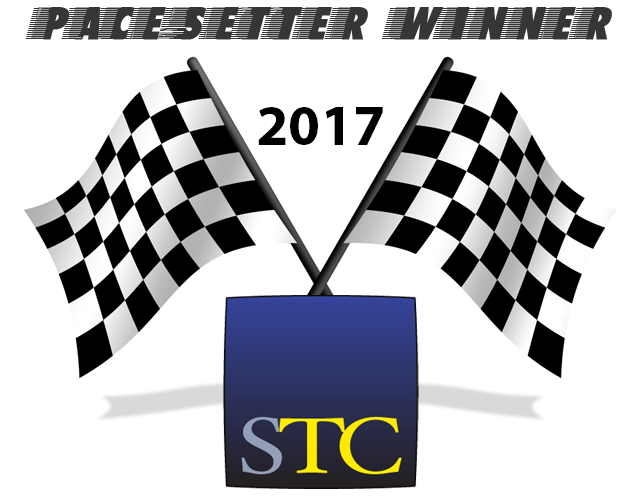 How can technical communication instructors capitalize on this rapidly expanding technology? This session will demonstrate how students can develop technical skills, increase content knowledge and understanding, and refine communication skills as they create podcasts for their course projects. It will also introduce the tools and technology necessary to set up your own course podcasting project. Finally, the session will share instructor and student reflections from a recent course that used podcasts as a major course project. 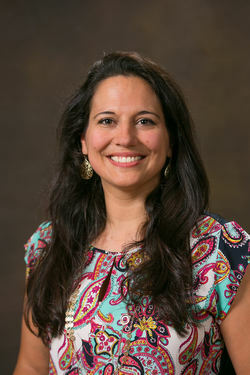 Jennifer E. Goode, Ph.D., is an instructor in the Department of Technical Communication at Mercer University in Macon, GA. She is the founder and director of Mercer’s Distance and Online Teaching (DOT) Lab, a collaborative initiative to support faculty development needs in the area of online teaching and instructional design. Dr. Goode has previously served in corporate, government, and higher education organizations in the areas of computer-based training, online course administration, and content management. Dr. Goode earned her Ph.D. and M.Ed. in Human Resource Education from the University of Illinois at Urbana-Champaign. She earned her B.S. in Technical Communication from Mercer University.